For the slightly more adventurous, I highly recommend travelling out of the city and exploring the neighbouring cities or towns and for a long weekend or mini staycation. 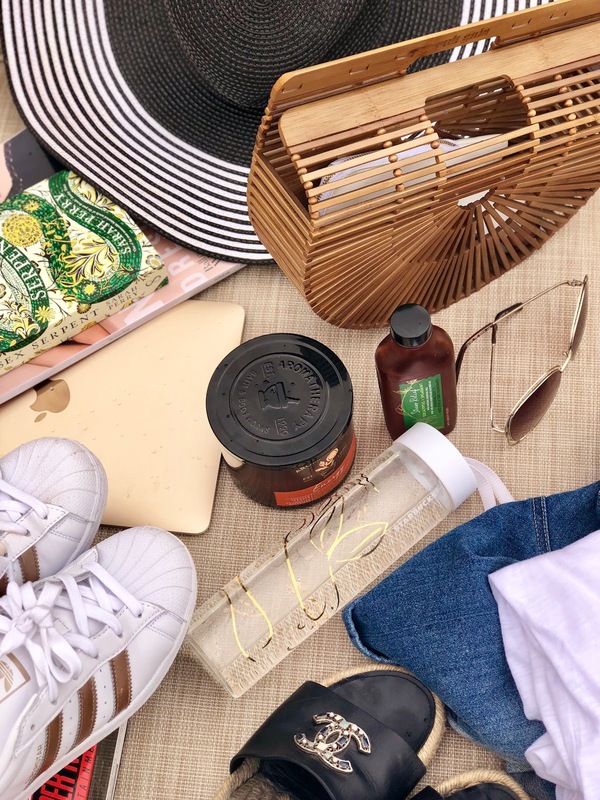 Wherever your planning on visiting on your well-earnt time off, here's a list of my travel essentials that can easily be packed into your luggage to make your trip that bit more special! Here's a look at my top items to take with me on a short trip / Staycation! The most critical of all travel outfits, in my opinion, is the basic white t-shirt and some denim shorts! Comfortably packed into any size carryon (even a neverfull) This outfit can be dressed up or down with a pair of Adidas classics, or a cute pair of Chanel sandals, posh sunnies, statement necklace and classic black sunhat. Nothing says summer holiday like this essential travel garb. I also tend to take two handbags away with me for short trips and for me the practicality and size of the LV Raspail makes this bag the ideal travel bag and the stunning aesthetic of the Cultgaia bamboo arc bag are my two top picks for a summer staycation. I tend to take as many beauty goodies as I possibly can when going away. Usually packing face masks, hair masks, body scrubs, lotions, oils, you name it! Staycations are for pampering and self-love, and I try and spend as much time as possible on hubby and myself, and these lovely beauty goodies make that possible. Living in any harsh climate, you need to hydrate and care for your skin. I have become obsessed with the Origins GinZing skincare range which offers everything from Energy-Boosting Gel Moisturizer, SPF 40 Energy-Boosting Tinted Moisturizer, Energy-Boosting Treatment Lotion Mist scrub and eye cream which revs up the radiance of my skin and brightens and zings with goodness. I recommend picking up a few of these fantastic skincare items and treating your skin, while away. Scent and lighting play a significant role melting away anxiety. I always treat myself to a new candle before a trip away, and these aromatherapy ones from bath and bodyworks are divine. I like to pop on the iPad for a spa soundtrack, light some aromatic candles and indulge in a couples Glamglow = Perfect Relaxation! I always take a trip to the bookshop before setting off on any journey for a good book and recently picked up The Essex Serpent by Sarah Perry and cannot wait to get transported into an imaginary world. I also recommend packing a few magazines for little poolside reading and cannot go anywhere without the latest copy of Vogue Arabia, which adds that little extra glamour to our getaways. These portable retro gaming systems are so easy to pack and are great fun for an evening in, while away! Although not to everyone's taste, we love to have an option of staying in if we chose too and what a great way to pass the time and getting in some nostalgic nerdy fun. In my opinion, nothing beats a good snuggle and a quick game of Mario before bed! If you're anything like us and coffee obsessed, then I would recommend in investing in a french press. Being on holiday shouldn't mean that you have to miss out on your three cups a day or having to spend a small fortune at the local coffee house. Investing in a coffee press is the way to go people, and we head over every fortnight to the local Starbucks for ground aromatic beans to make our own a home. It's brilliant having a Starbucks in the morning in your own home and let me tell you a bank balance lifesaver! Coffee presses are so portable that we now even pop ours in a carry case when we're off on our staycations, which means that we get to enjoy our favourite vice anywhere, even from the hotel room! I love to drink spa water or detox water in my regular life, so I always take a water bottle with me when going away, so that I can enjoy my spa water with San Pellegrino and lemon, even while on holiday. It's so easy to forget even the basic essentials while travelling and a water bottle is a must even for just basic hydration and with all the sightseeing or pool days, you'll be needing a lot! These are just a few of my Staycation essentials to make that trip just a little bit extra special. Hope you have enjoyed and given you a little inspiration for your upcoming getaways. Let me know your thoughts and if you have any recommendations.